eD@HoMe: 5 Lovely covers for today! 5 Lovely covers for today! To clear through the backlog of covers that I have received recently. Without too much elaboration, I would share these five magnificent covers with you for now. The first cover was sent by Jérôme from France. Merci mille fois! It was postmarked on 22 May 2009 in Eure in northern France and took 7 days to reach Singapore. Yet another beautiful cover from Poland, it is actually a FDC to commemorates the 20th Anniversary of the First Parliament's Democratic Election in Poland. Many thanks to Andrzej Bek! 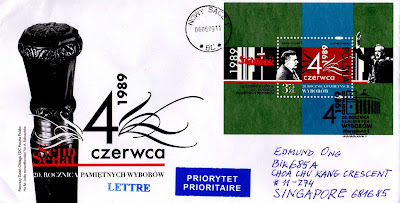 This cover was postmarked in Nowy Sacz in Southern Poland on 06 June 2009 and reached me 5 days later. Next is this awesome cover sent by Robert Brnka from Trnava in western part of Slovakia. Thank you very much! This cover depicts the beautiful Gothic church of St. Nicolas in Trnava. 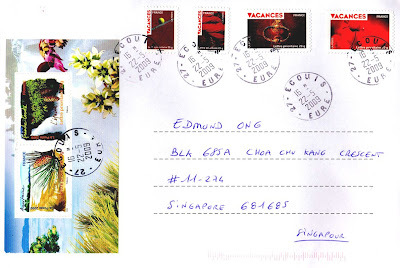 Postmarked on 10 June 2009 in Slovakia, it took 15 days to travel to Singapore. Special thanks to Jeevan Jyoti for sending this lovely cover from India. This cover was postmarked on 12 May 2009 in Shamshi, India and took 6 days to travel an estimated distance of 4,411kms to reach its destination. Last but not least, we have this great cover from Italy. Many thanks to Gottardi Lorenzo! It was posted on 04 June 2009 in Cogliate (Milano), Italy and took 6 days to reach Singapore. That's all for today! See you again. 3 Awesome covers from Slovakia!!! Nice postcard from Phillip Island Penguin Parade! 3 Awesome covers from Malaysia!!! A lovely cover from Indonesia! Awesome covers from Uzbekistan and Malaysia!! A lovely cover from Malta! Another great cover from the States! 2 awesome covers from the Middle East!